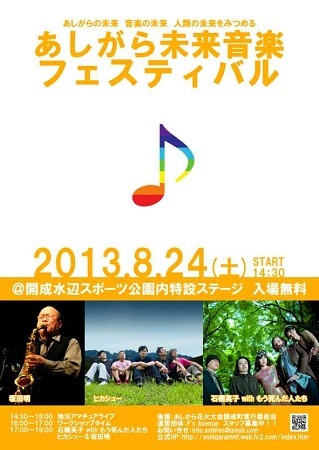 There will be a small but nice music festival held in Ashigara, Kanagawa next month. Ashigara Mirai Ongaku Festival (Ashigawa Future Music Festical, renamed from Sakasegawa Jazz and Rock Festival) will be held in Kanagawa prefecture on August 24, 2013, and Hikashu is appointed as the headliner for the event. The other acts are keyboard player Ishibashi Eiko's band, and veteran jazz saxophonist Sakata Akira. As being a community project, Ashigara Festival is advocated by a local politician, Tsuyuki Junichi. Mr. Tsuyuki is the former mayor of Kaisei town (where the festival takes place) and also an old acquaintance of Makigami Koichi and Mita Freeman (They attended the same high school). The event is admission free, and will be followed by a firework display. Japanese-style firework is surely worth taking a look.